Gluten free. Low FODMAP. Great for families. Looking for a quick and easy meal to prepare for a family on the low FODMAP diet? This recipe has it all! Packed full of FODMAP friendly veggies, this frittata incorporates the carbohydrate of pumpkin (in an appropriate quantity) and the protein of eggs to keep you and your loved ones full and satisfied. It can be eaten hot or cold and stores in the fridge for a couple of days for a quick meal prepared in advance. Add cooked pumpkin and all other raw frittata ingredients, minus the pepita seeds and sliced tomato. Stir until evenly combined. Pour mixture into an appropriately sized oven-proof dish (frittata should be about 5-7cm thick) that has been lined with baking paper or greased with olive oil. Cook for 20 minutes at 170 degrees C.
Lay the sliced tomato and sprinkle the pepita seeds over the almost cooked frittata and return to the oven for a further 20 minutes. Serve with steamed greens dressed with olive oil. This mineral rich veggie broth is perfect for the cooler months and can be enjoyed by itself or as a wholesome base to any soup or risotto. * If you aren’t sure what state of health your thyroid is in, or if you are already supplementing to support your thyroid, check with your practitioner before trying this recipe. Combine the water and kombu in a larger saucepan and soak the kombu for at least 8 hours or overnight. Add in the vegetables, turmeric, ginger and garlic and place the saucepan over low heat and bring to a simmer. Continue to simmer and then remove the kombu from the water just before it comes to a full boil. Add the shiitake mushrooms, and continue simmering for about 10 minutes. Remove the saucepan from heat and let the shiitake mushrooms steep in the broth for 5 minutes more. Remove the shiitake mushrooms and vegetables from the broth and pour the broth through a fine-mesh strainer set over a large bowl. How many of us run out the house in the morning without having a proper meal? Or perhaps we’re just not feeling hungry, in a rush and instead have a coffee and reach for something sugary by mid-morning? 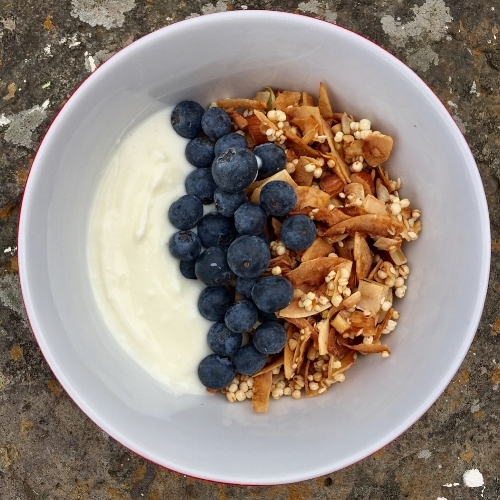 Starting up your day with a good breakfast habit is one of the fundamental ways to optimising your health, and will set you up for the day – balancing blood sugar (avoiding fatigue slumps, sugar cravings and brain fog), and also provides us with the energy and nutrients to make the most out of your day. The key is to a balanced breakfast is including all the macronutrients – protein, healthy fats, and carbohydrates; plus micronutrients in the form of phytochemicals vitamins and minerals found in fresh food. *…Ok, ok caveat here – It takes 20 minutes of prep a week to achieve a 5 minute daily assemble – but totally worth it! Allocate 20 minutes a week to cook up your greens/proteins and grains; then every morning all you need is 5 minutes to assemble – and voila! If you are not hungry take to work in a Tupperware and instead have the juice of half a lemon in 1 cup warm water – this will get those digestive juices flowing! Place in a container in the fridge. One a week cook up a couple of bunches of your favourite greens – like rainbow chard, silverbeet, broccoli, brussel sprouts, spinach (try to use organic greens as they are heavily sprayed with pesticides). Cut them up, add to a large pan with a 1/4 cup water (By adding just enough water so they don’t burn water the greens kindof steam/fry, locking in nutrients). Add garlic, onion, lemon juice, salt and pepper if desired. Every morning – assemble some of the above before you run out the door and pat yourself on the back for being organised as you enjoy a hearty breakfast in 5 minutes. Research says is takes 21 days to cement a new habit – go on try it! Your body and your microbiome will love you for it. Have you ever found that when you have decided you are ‘going to get healthy’ or you are determined to ‘feel better’, an all-or-nothing approach to food can sometimes make the process a whole lot harder? Food has many roles and meanings; it’s nourishing, fuel for your body, a way to socialise and a source of enjoyment. Food shouldn’t be a source of anxiety, guilt or fear. Whatever diet you choose to follow that best supports you in your ability to thrive, I hope there is room for delicious treats to enjoy in moderation (there certainly is in mine)! I wanted to share with you a recipe that is delicious and you can enjoy without guilt, remorse or regret. It is perfect for Christmas (or any occasion for that matter) and you’ll have your family & friends begging for more. 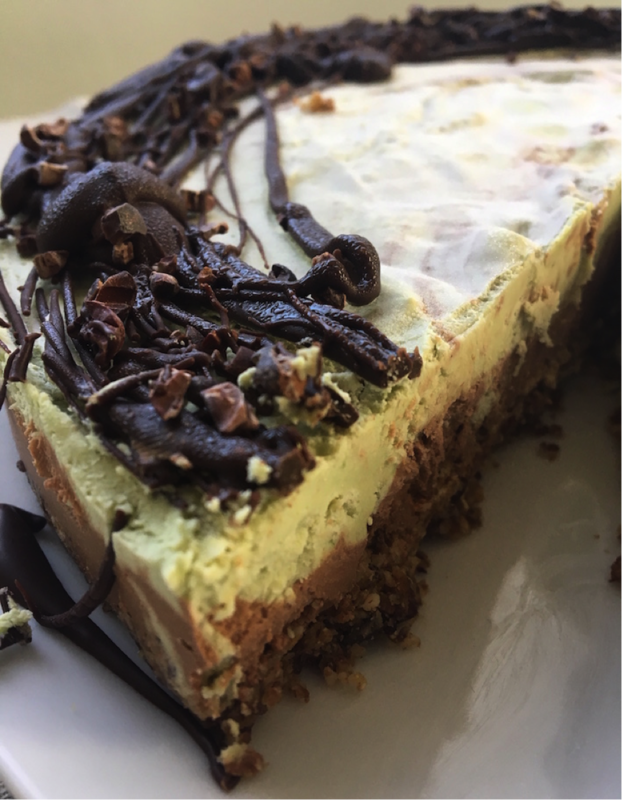 The best part is - it is gluten-free, dairy-free, soy-free, vegan/vegetarian friendly and refined-sugar free, but tastes just like a rich, classic cheesecake. 12-20 baby spinach leaves or 2-3 drops of green food dye (depending on how green you want the mixture). 2. In a food processor add ground hazelnuts, linseed/flaxseed meal, dates, coconut oil and salt to a food processor and blend until crumbly in texture. Add in cacao nibs and blend until they are mixed in. 4. In a blender/nutribullet add coconut cream, cashew butter, 1/3 cup coconut oil, maple/rice malt syrup and salt. Blend until combined. 5. Split the filling into two even quantities. 6. To one half of the mixture add cacao powder and blend until smooth. 7. Pour this cacao filling into the base and set in the fridge for 10 minutes (until slightly firm). 8. Whilst the chocolate filling is starting to firm, make the mint filling. 9. Add to remaining half of the mixture baby spinach leaves or green food dye, remaining coconut oil and peppermint extract/essence and blend until smooth. 10. Carefully pour the mint filling onto the chocolate mixture gentle swirling with the handle end of a spoon, to create a swirled chocolate and mint design. 12. Take the dessert out and drizzle over your melted dark chocolate to create a decorative pattern. Whilst the chocolate is still wet, sprinkle over some cacao nibs for an extra crunch. *I made my own cashew butter using soaked 1 ½ cups of cashews, soaked in water for 24 hours. I then drained these and blend in a Nutribullet (or something similar) until smooth – adding some water one tablespoon at a time to help. Storage. This dessert will last 3-4 days in the fridge, a few months in freezer. Who would have thought food and drinks affected by bacteria and yeasts would be so sought after? Yes, we are talking about fermented products. No doubt you have heard about them on social media, at your local health food store, or from a health conscious friend. Did you know, fermentation is traditionally a food preservation technique that has been traced back thousands of years. Fermentation has also helped us create new foods such as turning milk, wheat and grapes into delicious cheese, bread and wine(1). Yum! It was only in early 20th century that scientific researchers proposed that fermented products might have health benefits (2). Fast-forward to today and we have stacks of science supporting the presence of good bacteria in these foods and how they can provide us with wonderful health benefits (1). One of our favourite ways to reap the health benefits of fermentation is through eating fermented veggies. You may be familiar with fermented cabbage in the form of sauerkraut or kimchi, but did you know you can ferment a tonne of other vegetables including cucumber, carrot, beetroot and broccoli? Given that cauliflower is in season I thought this would be the perfect time to create a fermented cauliflower recipe. 1. Rinse the cauliflower in cold water and cut into florets and slice as thinly as you can. Place in a bowl along with carrot, spring onion, spices and salt and mix with your hands. Ensure everything is well mixed and then let this rest for 30 mins. 2. Get your hands dirty again and massage the mixture again for a few minutes. 3. Press the mixture tightly into the jar, adding bit by bit, pressing down to realise the veggie juice (brine) as you go. Don’t worry if the mixture feels dry, as fermentation continues the vegetables will continue weeping. 4. After the mixture is in the jar, make sure it is pressed down and the brine is covering the cauliflower mixture. 5. After 8 hours, open the jar and give the mixture one more press down, to ensure the brine covers the vegetables. 6. Rest the jar on a plate (in case the brine seeps out) and place it in a warm place, such as above the fridge, and cover it with a tea towel. Depending on time of year you can start to taste the ferment from day 4 or day 7. When it’s ready you will be able to sense a pleasant sour and pickled taste. 7. Give the mixture another press to submerge in brine, screw on the lid and store in the fridge. 8. You will have this delicious ferment if kept refrigerated for 9-10 months. Brine. Always have your veggies covered, if your veggies are above the liquid push them back under. If you realise this later in the fermentation process, remove the veggies that have been on top of the brine level as they are no good. Note: if you are new to eating fermented foods, start consuming small amounts and increase gradually. Also if you have an issue with histamines, fermented foods may not be a great choice. You have just discovered the low FODMAP diet and your tummy is feeling much better for it, but traditional Winter food feels so bland without onion and garlic! It doesn’t have to. 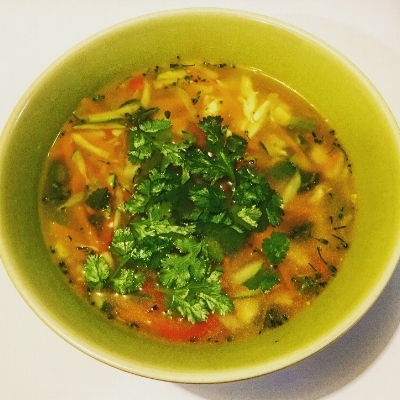 This delicious soup uses ginger, chilli and high quality chicken stock to give it some serious flavour. These warming ingredients are perfect for cold Winter nights, and the mix of fresh veggies makes it light, healthy and refreshing. Not only will low FODMAP be gentle on your tummy, but the gelatin in the chicken stock may aid the healing of a leaky gut, which often accompanies FODMAP issues. At Narayani Wellness we encourage the use of high quality organic chicken broth, as pesticides accumulate in connective tissue and are therefore often found in high quantities in non-organic meat broths. You can make your own organic broth or buy it ready made from most health food stores. For a vegan/vegetarian variation of this soup, substitute chicken stock with a homemade veggie stock. Tofu, tempeh or boiled eggs could be used instead of poached meat. Serves 3-4. Preparation and cook time 30-40 minutes. Gluten free, dairy free. Vegan/vegetarian option. Serve into bowls, salt and pepper to taste and top with fresh coriander! This gluten-free, dairy-free, vegan and vegetarian friendly recipe, developed by our naturopath Rachel, is the perfect meal or side dish to your favourite protein. There are so many elements to this salad that nurture and support your gut health with our favourite being fibre! Adequate intake of fibre for men is 30g/day and women is 25g/day (1), which most Australian's fail to meet (2). High fibre intake is proven to have health-protective effects and disease-reversal benefits including heart disease, stroke, hypertension, diabetes, obesity, and certain gastrointestinal diseases (3). Resistant carbohydrates and dietary fibre, from sources like sweet potato and lentils, influences the variety and number of bacteria we have in our gut, as well as their bacteria's metabolic abilities (4), which influences so many aspects of our health, including mood and immune function. So dig in to this delicious recipe and feed your gut some fibre. Add sweet potato to a lined baking tray and coat in coconut oil, garlic, salt and pepper. Place baking tray in oven and bake for 1 hour or until golden brown. In a large bowl add snow peas, rocket and lentils. Sit this aside. To make the salad dressing, in a small bowl add lemon, mustard, olive oil, oregano, salt and pepper. Stir until combined and pour into the large bowl. After the sweet potato has been in the oven for 45 minutes, add the broccoli florets to the bake try and bake for the remaining 15 minutes. After the baked vegetables are done, add them to the large bowl and mix well. Serve in your favourite plate or bowl with the option of adding your favourite parmesan or feta.